Deep garnet colour. Notes of red cherries, plums and bilberries with a hint of violets and dried roses. Long, soft, well-rounded finish. Dishes containing truffles, wild mushrooms and game. Selected from a vat produced in the cellars from the thirty vats produced each year. De-stemming, pumping over and turbo- punching of the cap. Vatting time : 25 days. Aged for 12 months in concrete vats and 12 months in barrels. Vintage 2013: Deep ruby. Perfumed aromas of fresh cherry, boysenberry, licorice and fresh flowers carry a peppery nuance. Juicy, sweet and pliant, offering very good clarity and aromatic lift to the flavors of dark fruit liqueur, lavender and spicecake. In a lush, ample style but showing very good energy, with solid closing thrust and smooth tannins adding shape. 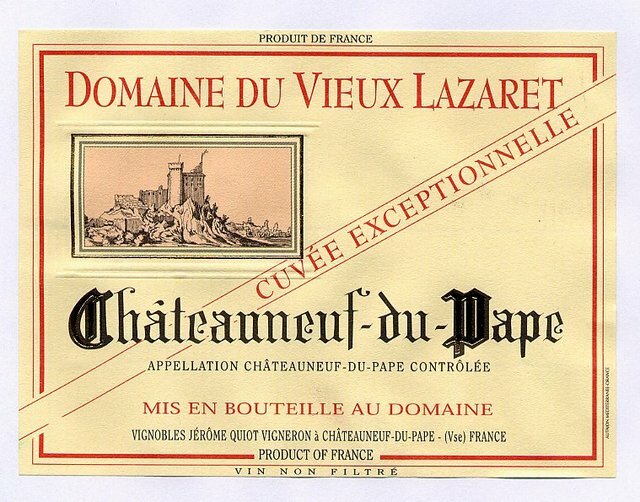 Vintage 2013: Possessing obvious oak in its black raspberry, vanilla and cassis-slanted bouquet, the 2013 Chateauneuf du Pape Domaine du Vieux Lazaret Cuvee exceptionnelle medium-bodied, forward and open knit. It’s slightly straightforward, but I do like it’s purity of fruit. Drink it on release and over the following 5-7 years. Vintage 2010 - USA Deep ruby. Exotic aromas of black raspberry and cherry-cola, with notes of incense and smoky minerals. Broad, fleshy and concentrated, offering sappy red and dark berry flavors, supple texture and energizing spiciness. Unfolds with air, picking up dusty tannins and trailing notes of sweet cola and smoke. vintage 2010 - USA Its dense ruby/purple color is followed by notes of black raspberry jam, kirsch, lavender, spice box, pepper and spring flowers. Rich and full-bodied with no hard edges, this opulent, voluptuously textured, dense, stunningly rich 2010 is capable of drinking well for 15-20 years. vintage 2009: The limited production of the 2009 is stunning. Beautiful floral notes intermixed with licorice, incense, black raspeberry, black cherry liqueur and a hint of camphor are followed by a dense, full bodied, opaque ruby/purple colored wine with layer upon layer of fruit and texture. This wine is very 2007-ish in style and personality and should drink well for 15+ years.